"The Chinese are cleaning our clocks in the cyber-world, as well as commercially." Oh dear. "Honesty, or candor, is highly valued in the Bureau." I couldn't help thinking about Nero Wolfe. I probably read the "The Doorbell Rang," a Rex Stout "Nero Wolfe" mystery story at least 20 times as an impressionable teenager. It was one of the 46 NW stories that inspired my lifelong love of the canon. Central to its plot was a real life book called "The FBI Nobody Knows," a controversial and very unflattering portrayal of the FBI, its director (J Edgar Hoover) and its agents. The book was considered to be a credible expose of all of the many unethical practices of the Bureau. I read it as soon as I could get my hands on it (in my twenties). Of course, this is the only book about the FBI I have ever read and hardly qualifies me as an expert. But impressions cemented in the heart and mind of a teenager are hard to shake. In the "Doorbell" fiction novel, a client hires Wolfe, a private detective, to stop the FBI from harassing her because she has mailed 10,000 copies of the FBI book to important people across the US. Despite his declaration that the job is "preposterous," Wolfe takes it on, and what follows is a delightful tale in which the Man bests the Establishment, in the (to-my-young-eyes) antique and charming 1960's. I've been skeptical of any law enforcement professions of "honesty" ever since, despite a family filled with law enforcement professionals including a father and brother in the US Marshals. What can I say? It wasn't only this Nero Wolfe book that generated my perspective. Nero and his obstreperous assistant, Archie Goodwin, both demonstrated a robust distrust of cops' behavior in general. I learned all about citizen's rights from these books. 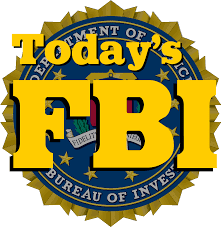 Stay tuned for FBI Tales: Part 2B on Crimes Against Children.